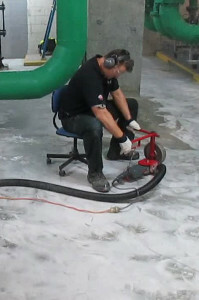 Most stand up concrete floor edge grinders are between 200% and 1,000% more expensive than a Situp Edger. None of them have the combination of speed and maneuverability that operators have with a Situp Edge grinder which comes down to “control”. Stand up edgers lack precise control of the grinding head. Even with powerful lamps it is not as easy to see the results when you are standing up. The torque forces of the grinding or polishing wheel are magnified when the handles are further away from the grinding wheel so control is very difficult. Larger machines take up a larger space on the worksite and in the truck. Larger machines are difficult to transport up stairs. Situp floats. This is the most important aspect for hand grinding so you can follow the floor levels, remove the high spots and grind the low spots. Visibility is the second most important hand grinding function. With Situp you are close to the work with great visibility of the ground surface. This saves grinding edges twice if you miss some areas. Control is one of the best features of a Situp Edge Grinder because the height vs the diameter of the diamond wheel was precisely worked out to provide excellent operator control. Having long handles at ninety degrees to each other allows the operator to have excellent control over the torque forces of the diamond wheel. Situp is up to ten times less expensive than stand up edgers. Simple construction with a powerful motor. The Situp Edger is very small and compact for storage. There is never any problem carrying a Situp Edger up stairs in one hand.